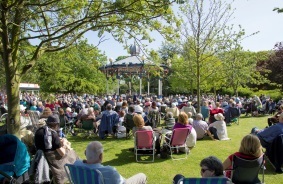 Southend’s popular live music series “Music in the Park” returns to Priory Park on Easter Sunday. This much loved event will see live music performed on the Southend Bandstand every Saturday, Sunday and Bank Holiday Monday from Easter Sunday until the end of September. This series of free performances welcomes everyone along to enjoy some great open-air music in one of the town’s most beautiful parks. Each performance runs from 3-5pm with a short break in the middle. Families are encouraged to come along, bring a picnic and blanket and enjoy some great music. The series starts on Easter Sunday, 21 April, with the Southend Band taking the stage. Monday 6 May – SenTIMEntal Vintage Trio. Throughout the summer, there is something to suit all tastes form big bands and brass bands, choirs, duos, quartets and op and dram companies. Scott Dolling, Director of Culture, Tourism and Property, said: “Music in the Park is such a fantastic series and it is always immensely popular with residents and visitors alike. See the full list on our Events page. All concerts are free to attend and there is some seating provided. Parking is limited in the park, but street parking is available nearby.